New from AudioLark.com: Letters from Home, written by Jo Barrett, narrated by me! Did I mention I'm now a pro? Yup! I've been doing some narrating for AudioLark.com, which publishes romantic audio fiction. Jennifer Feddersen, the owner and editor of AudioLark, has been terrific to work with and has given me lots of opportunities to narrate some lovely stories. 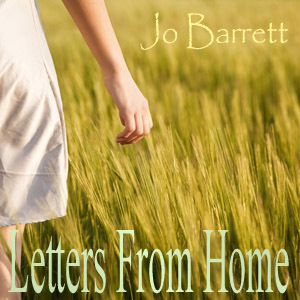 Letters from Home, by romance novelist Jo Barrett is one of them. In Letters from Home, the two main characters Phoebe and John are separated first by distance—he's a soldier stationed in Iraq when they begin corresponding with each other—then by a misunderstanding, and also by their own mistaken beliefs about themselves. They are good people who belong together, they just don't know it...yet! The story takes place in a Mayberry-like small town in North Carolina, and I really enjoyed getting to know Phoebe and John, as well as all of the other characters. Being a writer myself, I always feel a big responsibility when it comes to narrating other writers' stories. I know all of the time, and energy, and love that is involved in shaping one's vision into words. 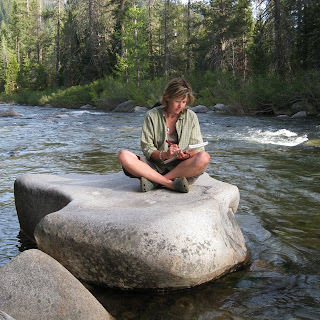 When I'm reading a story aloud, I try to immerse myself in the world of the story, and not think about how it sounds, but instead tell the story in a way that rings true for me. I hope I was able to do that with Letters from Home. A tiny tease...uh...I mean...an excerpt. Yeah, an excerpt! Here is a smallish excerpt from the as-yet untitled sequel to Dreaming of Deliverance . I know, it's short, but at least it's something! The truth is, it goes against my nature to release anything before I've finished the novel, because I will spend a lot of time revising the manuscript and who knows what will be cut or changed? But something tells me this little snippet will remain in the ultimate version. Oh and there aren't any spoilers here, but if you really don't like to have any inkling as to what's coming next, or if you haven't finished Dreaming of Deliverance , you'll want to skip the rest of this entry. “What are you talking about? Go back where?” I was crying now too. Somehow I knew what she meant, but I didn’t want to believe what she was saying to me. “Go back. Go back! To them! To help them. They need you. Oh…it’s unbearable!” Her mania broke and she dissolved into exhausted weeping. I stumbled away from her, appalled. She worked her hands free and pressed them to her head on either side, like she was covering her ears trying to block out some terrible sound. 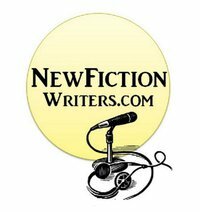 Now on NewFictionWriters.com: "Ghost Town" written by Rebecca Wright, narrated by me! Leave it to me to blog about my upcoming entries, and then my next entry isn't any of the ones I mentioned! Those others are still in the works, still coming. But for now, I wanted to let you now about a story I narrated for NewFictionWriters.com. It's called "Ghost Town" and it is such a touching and engaging story. The main character, Leah, is around 13 years old and is searching for her younger brother and dealing with the after-effects of Hurricane Katrina. I did not attempt a New Orleans accent, kept it southern, but I really like how it turned out. I hope you enjoy listening to it as much as I enjoyed reading it! The 52/25 FB group, review compilation, the excerpt dilemma, and my acting heritage! I'm flying by to give you a heads-up on some upcoming blog entries. But before I do that I want to remind you about our Facebook accountability group the 52 Weeks, 25 Stories Challenge. There is now a 52/25 blog and there might be a podcast. You don't want to miss out! We're getting lots of new, motivated members. It's going to be SO helpful for me, even though I'm not participating the right way: I'm not writing stories. Instead, I'm going to work on DoD 2: at least one hour a day, six days a week. I've been chipping away at it all along, but this should really amp up my progress. Anyway, I'd love to see you there, so head on over and sign up! Also, I'm working on getting my reviews and interviews all together in one page on my web site. It's been really amazing going through them and remembering all of the incredible feedback I've received on Dreaming of Deliverance . That should be up at REChambliss.com before too long. As for upcoming blog entries, I'm still trying to decide whether or not to post excerpts of DoD 2. What do you think? Do you like reading excerpts? Would you like a taste of what's to come? But there are a couple of blog entries I know I'm going to do in the next couple of weeks. The first will be on running and DoD. JP told me months ago that he listened while running and I was so touched and pleased about that. Since then, I've found out that other people have also listened while running. I think that's incredibly cool and will be sharing thoughts and photos about it soon! Also, someday I want to write the story of my actor grandparents, Woody and Erika Chambliss, and as a start, I plan to blog here about them. Neither are alive anymore, but both are very close to my heart especially now that I'm doing some acting myself. Their stories and backgrounds are absolutely fascinating and I can't wait to share them with you. But right now I need to get back to the post-NYE clean up and then do some more writing. See you back here soon! Happy New Year! Peace and positivity for 2011!